Being honest as always I was completely flabbergasted and totally speechless when I see that the much loved Shoot for the Stars bath bomb had, had a complete make over. The makeover wasn’t even a slight tweak here and there, the new Shoot for the Stars bath bomb is in all intents and purposes a brand new bath bomb. Apart from its scent the new version of Shoot for the Stars is completely unrecognisable. Both designs are undeniably star orientated but until I see the name of the new version I wasn’t at all aware that it was in fact the same bath bomb reinvented. Some Lushie’s (me especially) do not bode well to such drastic changes, I however always trust Lush’s decisions and wanted to give the new version a go. The new bath bomb is blue all over and decorated with 3 visible golden stars. It wasn’t apparent to me until I had actually used the bath bomb that the golden stars are in fact chunks of bath melt. The stars are made of a mixture of what I think is cocoa butter and coconut cream, they make Shoot for the Stars one of the most skin-hydrating Lush products I have used to date. Long term Lush fans will notice that the Yog Nog Bath Bomb much like the retired version of Shoot for the Stars didn’t make a return in this years Lush winter line. I wasn’t particularly bothered by this as Yog Nog was never a particular favourite of mine, however for those that did like it you will be happy to learn that the new Shoot for the Stars bath bomb is (in my opinion) a combination of both the older Shoot for the Stars and Yog Nog bath bomb. Shoot for the Stars’ scent is about the only thing that has remained the same when comparing it to the earlier version of it. The Shoot for the Stars bath bomb comes from the Honey I Washed the Kids scent family. Honey I Washed the Kids is a very sweet and moreish scent, my nose can detect several sweet layers, a soft honey aroma (although honey is not an ingredient in it, making it 100% Vegan) as well as hints of toffee and a subtle smidge of gooey caramel too. I don’t always get on with the sweet smelling products however the Shoot for the Stars bath bomb isn’t at all sickly and I have grown very fond of it and the Honey I Washed the Kids scent. 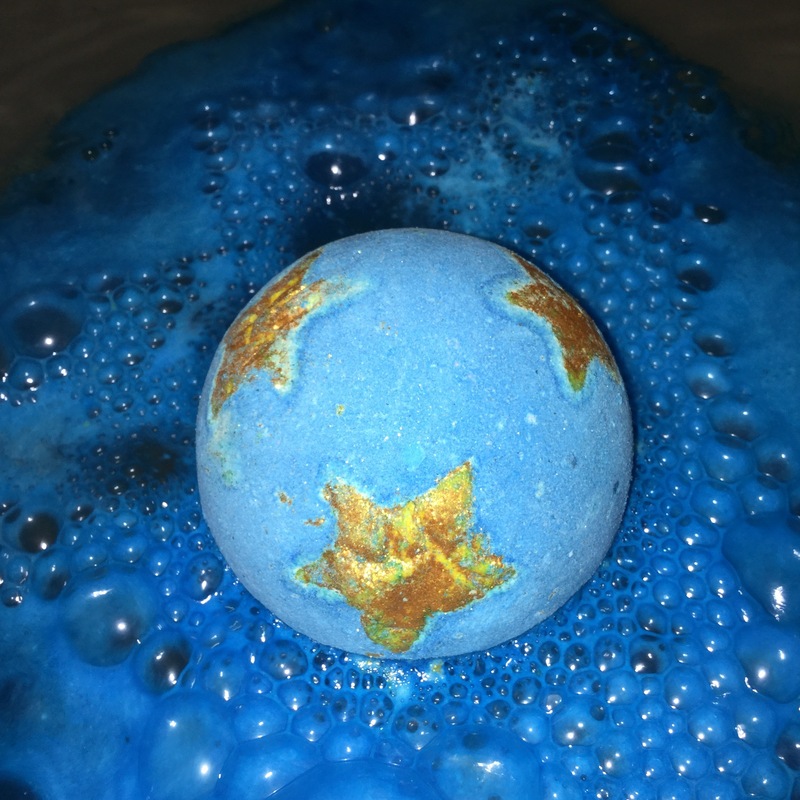 As soon as the Shoot for the Stars bath bomb hits the water a fierce fizzing of royal blue bubbles shoot out of it, gradually turning the rest of your bath water into a deep shade of midnight blue. After a few minutes of it fizzing away I noticed the stars. When I first used it and see the yellow bits bobbing about, I couldn’t help but grab the bath bomb to get a better look at it. As you can see in the pictures below the new Shoot for the Stars is completely different from anything Lush have brought out before. The stars at the point of time this photo was taken were no longer a dusty gold colour, it is at this point that I realised that the stars were not part of the bath bomb and were in fact bath melts. As the bath bomb fizzes away the stars separate, floating to the top of the surface, going off on their own individual journey. There are 6 stars in total. 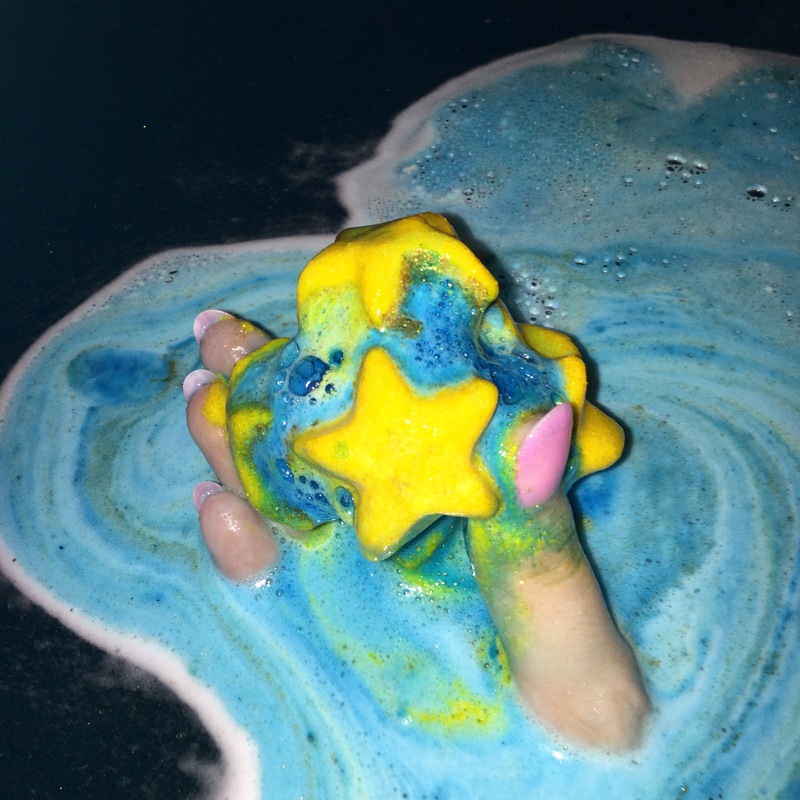 It is advisable to use the Shoot for the Stars bath bomb in quite a hot bath, this way you get the full benefits of the bath melts, the warmer temperature helps the cocoa butter melt. Once melted you can see a coating of moisturising oil splodges on the top of your bath water. I couldn’t help but compare the last picture I took below to Vincent van Gogh’s The Starry night. A Shoot for the Stars bath really is a work of art! When I realised that the stars were in fact bath melts I was a little worried that it would make me and the tub super oily, I was however very pleased to find that I didn’t get out of the bath looking like I’d been bathing in an oil slick. The bath was also fine after a quick hose down. Once out of the bath my skin looked and felt fabulous, in addition to it feeling so much better it also smelt gorgeous. The scent stayed with me for ages, hours and hours after getting out of the bath I could still smell the sweet toffee scent on my freshly revived super, soft skin. 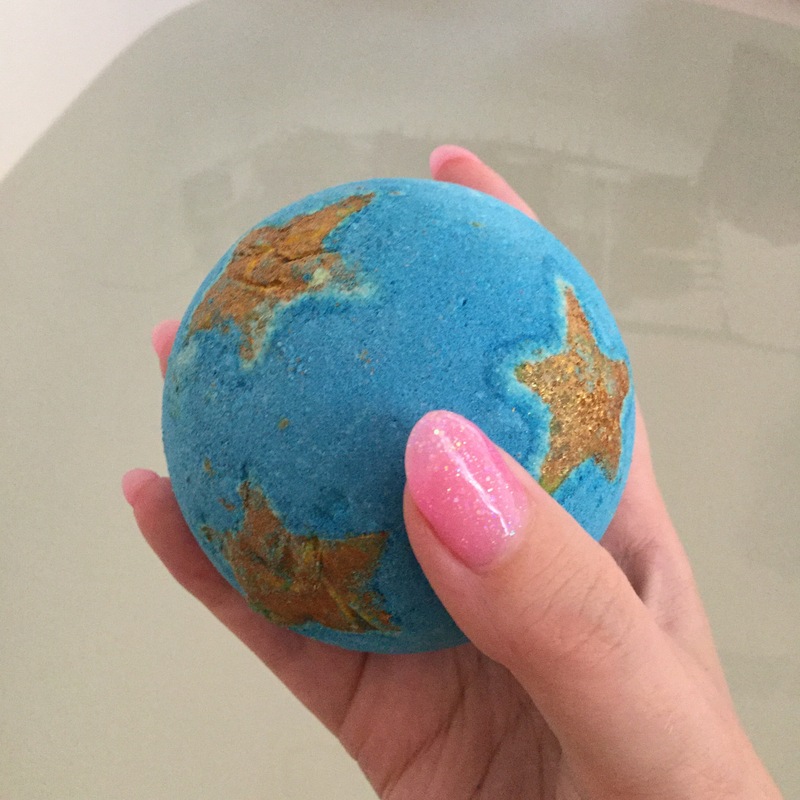 There are some reasons I prefer the new Shoot for the Stars bath bomb over the older one and vise versa. I enjoy and love both versions although I did find the new version more entertaining to watch in the bath tub. There is just something so interesting about the big butter stars and the way the water looks once the bath bomb has finished. I have heard a rumour that the new version of Shoot for the Stars will be replacing the recently discontinued bath bomb Honey Bee. If the rumour turns out to be true it will mean that Shoot for the Stars will be available all year through which is very, very exciting. Keep your fingers crossed!